My favorite show right now: The Real L Word. That Whitney is addicting. Last movie I watched: It might have been I.O.U.S.A., but I didn’t get to finish before Netflix had to be canceled. Recent project to take on: learning Virtual DJ. But on to more important things! Even though I was technically in Pheonix during my beloved First Friday, I missed it in lieu of hanging out with friends in Tempe for my birthday. Which was awesome, to say the least. So last night I resumed my art opening adventures in San Pedro, which is 30 miles south of Westwood, where I’m staying. So a hop, skip, and a 405 trip later I arrive in a lovely little downtown block of a suburb. This First Thursday (I think it was called) was small and intimate, reminded me of the Phoenix art scene a bit, with smaller more independent galleries. The first gallery I went in had a twist on Southwestern art though, *sigh*. I can never escape those damn Kokopellis. If you don’t know what those are, then you are not from the Southwest. They would be more enjoyable if they weren't so overdone in the Southwest! 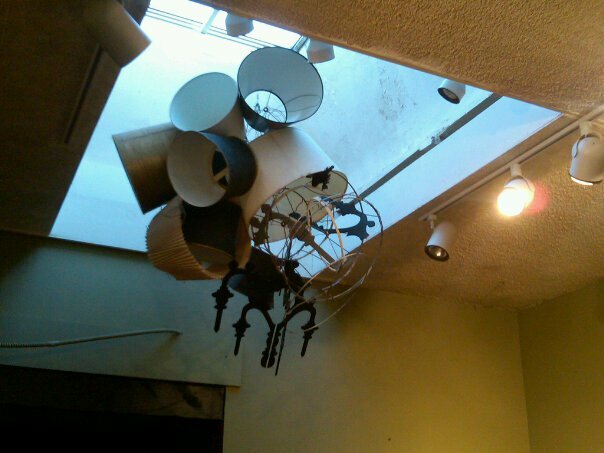 The gallery did, however, have this awesome hanging lamp sculpture. The thing about this art walk, was that the galleries didn’t have cards or anything really that I could take so I could remember the artists or even the name of the galleries. That was kind of diminishing. There was in one gallery/arcade/dub-step clothing shop (?) these really creative window panes with photo prints in them. Again, I wish they had been labeled, because I have no idea who the artist was. Onward ho, I shuffled through some other galleries and a few open studios with a few things catching my eye, an abstract artist that had a style that resembled street art. Another one had a cool print making style, unfortunately I didn’t write down his name, since I think his art was actually labeled. Oh how I love it when they have cards to put out. Also a feature of this art walk was food trucks. I finally got to eat at my first food truck in California; I was so excited. 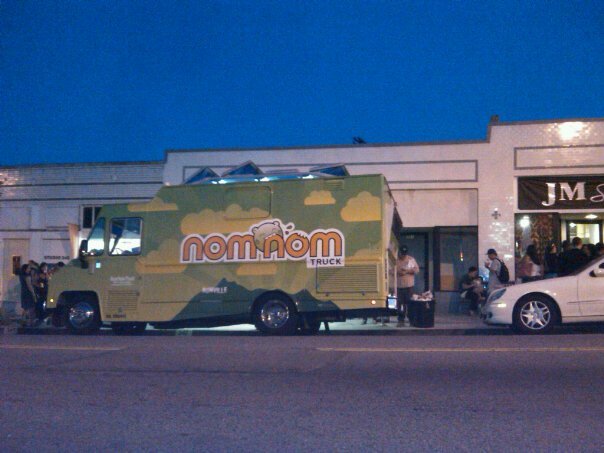 We picked the Nom Nom truck because my roomie had heard great things. And finally, the actual reason we drove 30 miles for an art walk that didn’t offer much in my preferred scene, was because my roomie met an artist on the bus ride to San Francisco last weekend and he had a painting in one of the galleries. And arguably, his was better than the rest of what I saw. Also this new gallery, slightly off to the side of the mini row of galleries, had a showing of art that I felt had more to offer in the realm of creativity. Maybe it was hipster art, but I like hipsters. HUDSON|LINC also, unlike the place that served warm white wine (bitter beer face), served cold PBR. Hipster-tastic. So the name of this show was “Social Being” and involved art that worked itself around the social media and online presence that has taken over our society; it included a portrait of Tom from Myspace done in those circular beads that we used to iron one side of in the 90’s to make craft art projects as children. The painting by Steven Wolkoffwas actually a new concept to me. I hadn’t ever seen anything that involved the paint squiggles like he uses. 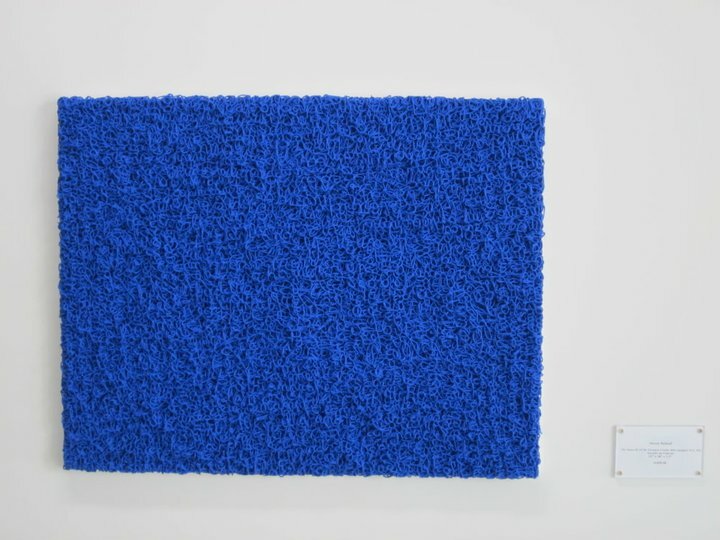 And despite that abstract art doesn’t tickle my fancy like it used to, this one had me. Maybe it’s because the title is “The Names of all My Facebook Friends (Blue Squiggles #12)” which automatically forces you to start searching out names. There are quite a few so it makes it hard to find any. Most fascinating is the amount of time it must take to let each layer dry; more patient than I. Little paint squiggles all over. Layers of them. I think that concludes this edition of my Los Angeles art adventure, or I should say San Pedro. Hopefully I will get to attend some more fun things this weekend. Enjoy! This entry was posted in Life and tagged Art, california, food, Los Angeles by Bethanie the Wookie. Bookmark the permalink.